London’s first National Park City Week was a vibrant success, with thousands of people across the city coming together to celebrate our amazing green spaces and waterways as we prepare to become the world’s first National Park City in 2019. Scroll through the slide show to see photos from the week. London National Park City Fair 2018 photo credit: Justin McDermott. At the National Park City Fair at Conway Hall in central London, we explored urban food growing, car-free days, citizen science, community story creation, parkour and more – all in the company of a talking dog, Rooney! Inside Beckenham Place Park in Lewisham, children discovered how a straw bale garden worked, followed a fun kids’ trail, tasted some great local produce and met a friendly scarecrow. The Crofton Park Railway Garden took their visitors on a walk along the Brockley Three Peaks Trail, while back in the garden they had the chance to try local produce from stalls, count butterflies and take home seeds to grow their own. The Daubeney Fields User Group and Hackney Council held a community picnic to hear bright ideas on making Daubeney ten times greener and showcase the work that has already been done to ‘green the grey’ and de-pave the area. A Smell & Touch Sensory Safari at Geraldine Mary Harmsworth Gardens near the Imperial War Museum saw intrepid visitors track local flora, learn the history of London’s plane trees, make bark rubbings and even attempt to paint smells! In Twickenham, the London Wildlife Trust guided eagle-eyed bug spotters on a dragonfly walk exploring the River Crane and Crane Park Island, spotting dragonflies and damselflies, and collecting data for their city-wide dragonfly survey. The Granville Community Kitchen in north-west London gave a mouth-watering tour of their inner city growing spaces, which provide healthy and affordable food for the local community. The spaces were packed with amazing vegetables and herbs to sample or take away. 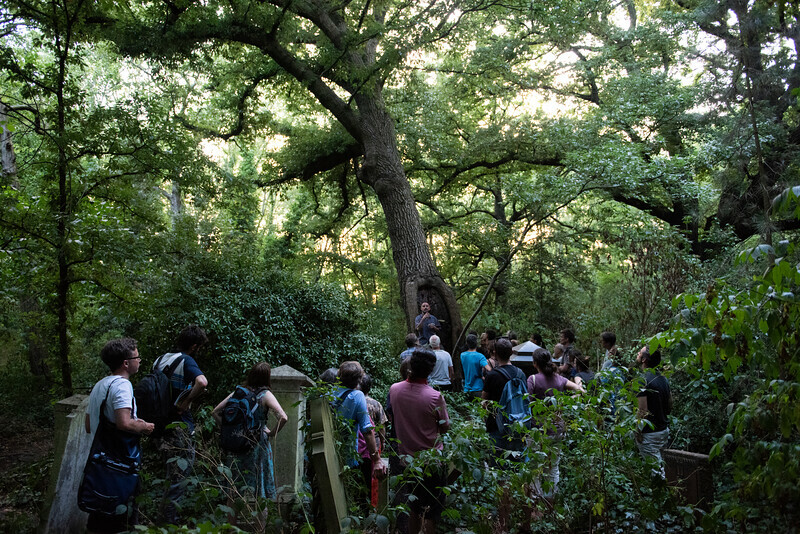 Ecologist and arboriculturalist Russell Miller of the Tree Musketeers took tree-lovers on a guided evening walk of Abney Park in Stoke Newington, exploring the wild beauty of the nature reserve and the importance of old trees for wildlife. Watch our video about the week. We want your help to make London a National Park City! Thousands of Londoners are doing simple things to make our city greener, healthier and wilder. Sign up to join in. How the Mayor is helping to make London the world's first National Park City. Find out how you can do simple things to make our city greener, healthier and wilder.